A one-stop-shop creating a custom do-it-all wheel loader. In mid-2017, Ray-Mont Logistics was looking to open a new transload facility in Prince Rupert, British Columbia. 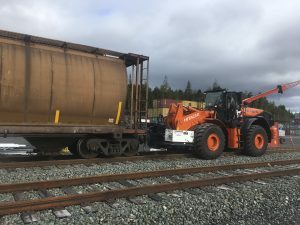 The first of its kind on Canada’s west coast, the 10-acre facility built on Ridley Island included a rail loop corridor of more than 100 railcars, a grain dumper pit, and a state-of-the-art conveyance system. Able to load the railcars with Canadian grains, pulses and cereals in just three to four day days, Ray-Mont Logistics needed to ensure it could keep smooth and efficient operations of the facility all year long – especially in the various Canadian seasons. How would it keep smooth and efficient operations of all the moving pieces? With the opening of the facility fast approaching, Ray-Mont needed a one source supplier to ensure its facility could be easily maintained without adding in large number of machinery and equipment. 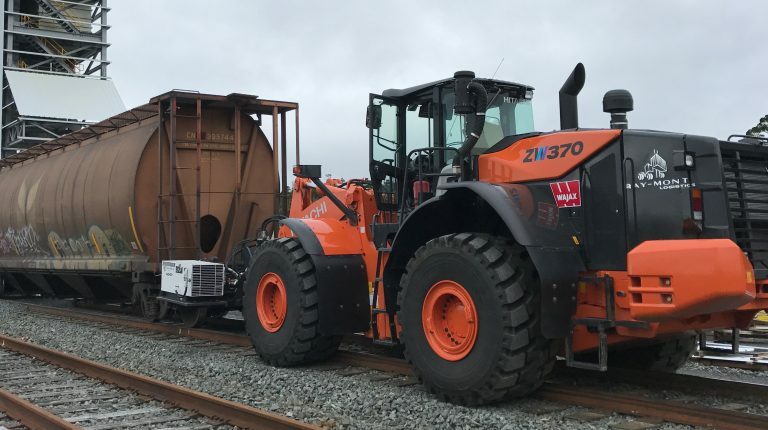 Leveraging its years of industry and technical experience, Wajax proposed the Hitachi ZW370-5 Wheel Loader with a few custom modifications – this way one machine could do all Ray-Mont needed. As part of the modifications, we retrofitted a custom rail hitch and a rail car airbrake system to allow for the safe movement of the railcars in the yard. We also added a general purpose 7.3-yard bucket-enabled snow remover and aggregate material transporter. Finally, our last modification was adding a rotary pick-up broom, which would facilitate yard sweeping and track clearing. Along with this machine, we also provided and continue to provide ongoing service and support for these machines – truly being their one-stop-shop for their do-it all wheel loader. Delivered on time, on budget, and able to do it all, the Hitachi ZW370-5 Wheel Loader proved to be indispensable in the facility’s operations. Seeing our custom solution tailored to its needs, Ray-Mont soon added two Hyster RS46-36 Reach Stalkers to its Prince Rupert facility and a second wheel loader to its Richmond site. With it’s Prince Rupert facility fully operational and running efficiently, Ray-Mont is positioned to capitalize on the growing demand for transload capability.